Demand for the Chevrolet Sonic, shown, and Buick Verano has plunged. DETROIT -- General Motors will lay off about 500 workers at the assembly plant where the Chevrolet Sonic is built, the latest symptom of sagging demand for small cars as consumers buy more crossovers and SUVs. 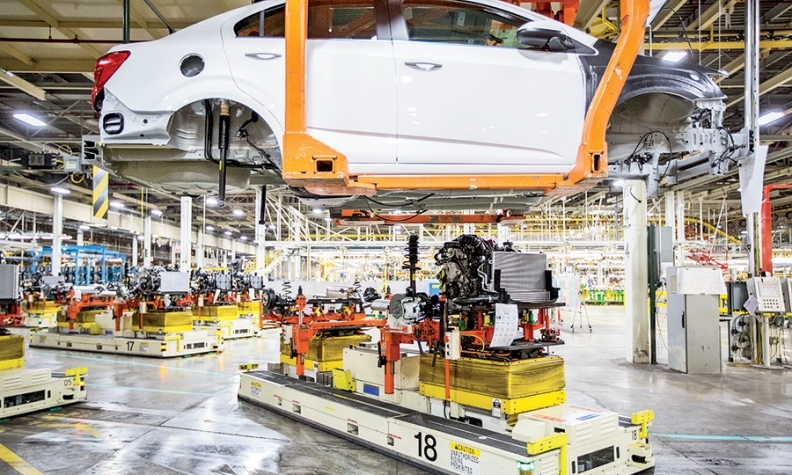 GM confirmed in a statement that its Orion Township assembly plant in suburban Detroit will “adjust plant production capacity to align with market demand” by reducing to one shift, from two. GM said most laid-off employees should be able to transfer to other GM operations, including the Detroit-Hamtramck plant, which GM said on Thursday would add some 1,200 workers for a second shift to start early next year. “We are confident we will be able to make transfer offers to Detroit-Hamtramck or other GM locations for the vast majority of those who are affected by the shift reduction,” the company said. GM officials were scheduled to inform Orion workers of the layoffs early today after second shift, two people with knowledge of the matter said. Union officials have informally told some workers in recent days about the pending shift elimination, one of the sources said. The move comes amid rising dealer inventory of the Sonic and Buick Verano, the other vehicle built at Orion, despite several production cuts over the past year. GM has idled the plant for several weeks this year and in June cut the hourly production rate 21 percent, to 26 cars per hour. But inventories continue to creep higher as sales of both cars stay cold. As of Oct. 1, there was a 116-day supply of Sonics on dealership lots or en route to stores, up from 98 days a month earlier, according to the Automotive News Data Center. Verano stocks were at 100 days, up from 81. Verano sales dropped 27 percent in the period, to 25,002, also a far bigger decline than the rest of the compact car market, which rose 1.6 percent over that span. It’s unclear whether GM would add back a second shift at Orion when at least two new vehicles begin production there in coming years. The Chevrolet Bolt electric vehicle will be made at Orion and go on sale in late 2016, GM officials have said. Another, unidentified vehicle is scheduled to start production there by 2018. Industry sources believe that will be a small Cadillac crossover. GM has signaled bigger plans for Orion. It has invested $962 million in the plant since 2010, including $405 million over the last year. GM has made the Sonic at Orion since 2011, when the company became the only automaker to build a subcompact vehicle in the U.S. under a special labor deal with the UAW. The pact allows GM to use a higher percentage of lower-wage Tier 2 workers at Orion, along with workers from in-house suppliers who make even less than the Tier 2 employees. Higher production costs in the U.S. generally make it tougher for automakers to turn a profit on smaller vehicles. In September, GM CEO Mary Barra said the automaker does not plan to follow Ford Motor Co.’s decision to move small-car production in response to weakening sales. Ford said in July that it would stop building the Focus and C-Max cars at its Michigan Assembly plant near Detroit in 2018. "We have some very important small cars" built at the Orion, Barra said. "We have no plans to change that."